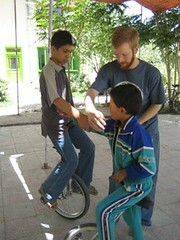 Many of you have asked for updates on Zach Warren, former Alphachimp intern who has been helping the Afghani Children's Circus in Kabul. 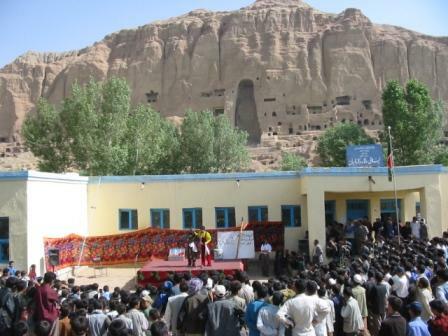 The full article contains a letter detailing his travels to Bamyan bazaar, a site where Buddhists and spiritual seekers have lived, studied, and gathered from all around the world since the 5th century (AD); the site of the famous Buddhas that were destroyed by the Taliban because they were considered images/false idols. It is hard to imagine that a year ago, we saw Zach performing in West Park on Pittsburgh's North Side at a community arts fair. He was riding a 7-foot unicycle, juggling flames and inspiring awe and admiration from tough Northside kids. In March, I was in Boston on business and walking away from Harvard Square when I spotted the inimitable profile of a skinny, bespeckled man with a flaming red beard and brilliant smile on an enormous unicycle (a sight one usually does not encounter outside Harvard Stadium on a blustery Spring afternoon). It was at that chance meeting that Zach announced his intentions to beat the World Record for the fastest 100 miles on a unicycle. Well, read on for more interesting details in Zach's own words. A brief slideshow of photos from performances in Europe and Afghanistan are here. 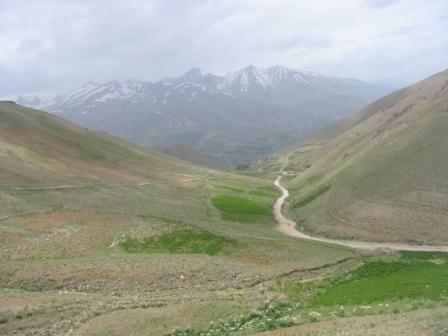 Zach Warren's first missive from Afghanistan is posted here. I hope this finds you safe and in good spirits. Nearly one month ago, what little I knew of Afghanistan I knew by pictures and words, maybe a couple good books, like Kite Runner or An Unexpected Light and sound bites from the Boston Globe or Washington Post. Even if I knew better, I still had in my mind images of stoic-faced men with turbans and rocket launchers hiding in caves. The news wasn't pretty specific. "17 suspected dead in helicopter crash...explosion in internet cafe kills several foreign NGO workers...U.S. forces growing closer to Osama... Concerns for escalated violence as Parliamentary elections approach...Hamid Karzai to root out "foreign spies" in government..."
What it didn't, and doesn't, convey about Afghanistan is what I consider so far to be at the heart of my experiences here: the laughter, tenderness, hospitality, and religious and ethnic diversity in daily life. I hope I can share some of that with you, to round out the news reports. A week ago I found myself bouncing around in a van with a cracked winshield on the famous road between Kabul and Herat with seven married Afghan men for ten hours at a time. We passed through the former Kush Empire, through lands once under Greek rule by Alexander the Great, past the mysterious caves and mountain-castle of Zoroaster, through herds of goats and dozens of streams, past upside-down tanks and empty roadside rocket shells, and finally through the remains of the Bamyan bazaar, a site where Buddhists and spiritual seekers have lived, studied, and gathered from all around the world since the 5th century (AD). This was the site of the famous Buddhas that were destroyed by the Taliban because they were considered images/false idols. Along the way, Hamid, Du'ad, Nadir, Asad, Jamil, and Sher Khan have more than a dozen laughing fits. I'd never seen a group of Afghan men laughing playfully until this trip, even though it happens all the time here. They sing to the radio and clap until my ears echo with Indi and Afghan pop music. We stop along the way and squat by a river, eating fresh mangoes and watermelons, then for daily prayers. They tease me like a close friend and we break bread together at every meal, eating naan flat bread for breakfast, then potatoes, rice, oils, and naan for lunch and dinner. Attached are a few pictures from the Bamyan performances, including one where you can see the smaller Buddha in the background (or the great rock inset where it used to stand over 100 feet tall. It is said to have had a gold plated face that reflected light onto the town of Bamyan in the morning sunlight). 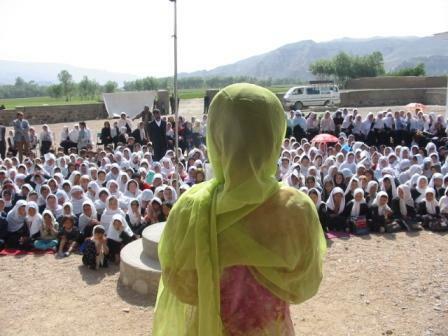 We also performed beside the green waterfalls of Banda-amir, and at schools in Shaidon and Didir. These performances were entertaining for the audiences, but they always deliver important messages in powerful ways. Skits include, for instance, a piece on conflict resolution that uses a frog, a horse, and a bear, where the frog and the horse can't get along, and the bear enters as the peace-maker. Since it would be inappropriate for the MMCC performers to speak about conflicts between Afghan ethic groups directly, the metaphorical use of animals conveys the same message indirectly. Other skits teach about hygeine, malaria prevention, and safety measures to avoid land mines. In a region where culture and custom is often said to trump laws and rules, the use of persuasion through circus arts is an especially pragmatic method of promoting social change. Simply handing out brochures, posting posters, or talking to local elders seems to change very few minds alone. 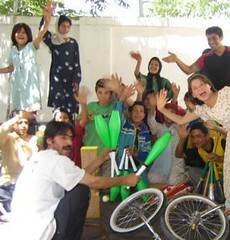 Now I'm back in Kabul, training a group of Afghan kids for an upcoming tour of Germany and Denmark, beginning August 3rd. For most of them, this is the second time out of the country. The first time was when they fled to Pakistan or India during the Taliban regime. Nearly all of the MMCC kids are refugees, and the population of Kabul continues to soar as Afghan families return to their native lands (some ethnic groups have waited generations for this chance). I'll likely perform there over Christmas instead, if exams allow it. 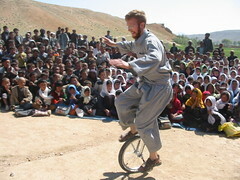 Also, the www.Unicycle4Kids.org website has been updated, and so has the MMCC's website: www.AfghanMMCC.org . If you're curious, I invite you to check them out, and of course feedback is always welcome.